We’re at the fourth preview of this David Mamet classic when, 10 minutes in, actor Robert Glenister (pictured above) collapses clutching his chest saying: ‘Oh God!’ and the curtain comes down early. The stage manager asks us to remain in our seats and for 20 minutes or so we wait for news from the stage. We’re sat in the fourth row and can see shadows under the stage curtain and it looks to us as though Glenister remains where he collapsed and is receiving medical attention there. The curtain goes up, the stage is cleared and the venue’s deputy manager explains that Glenister is up and about (to a spontaneous round of audience applause) but that tonight’s show is cancelled. We will be given written instructions as we leave the venue about how to exchange our tickets or claim a refund. Star Christian Slater appears onstage for the first time in the evening (he’d yet to appear in the show) and apologises. We go to the underground venue bar where our interval drinks are waiting to discuss what has just happened with out fellow audience members and the staff who appear to know less than we do. As we are about to leave, Slater appears in the bar (with who we assume was his bodyguard) to shake our hands, ask us to return to see the show later in its run and even to take a selfie with at least one audience member. It’s the sort of PR triumph we can’t imagine many actors pulling off in what must have been especially trying circumstances. Get well soon from all at monstagigz to Robert Glenister. 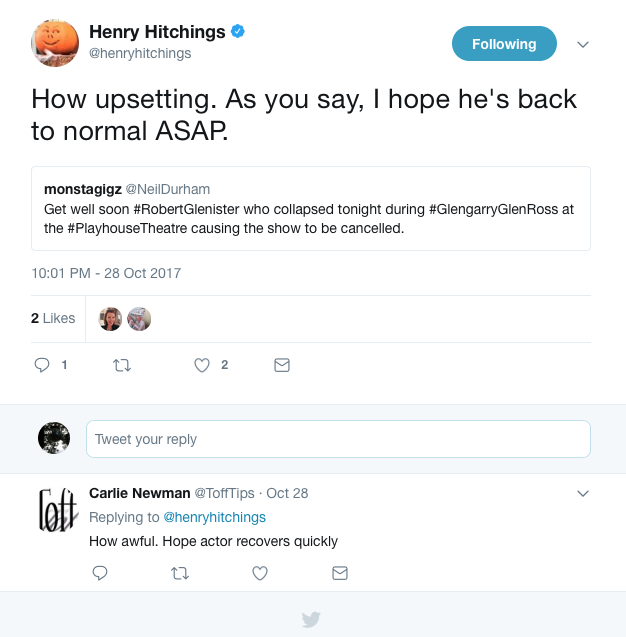 We’ve seen many things in our years of theatregoing but nothing quite so concerning on a London stage. The play itself is about the pressure put on salesmen in 80s America as they compete to see who will keep their jobs. 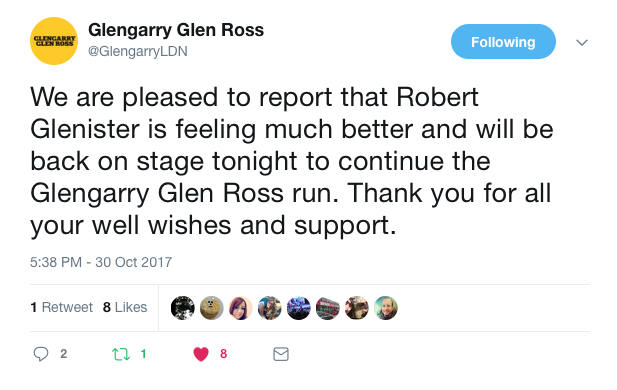 We’ll definitely be returning later in the run and wish Glenister and his family all the best.